Government Employees Co-operative Housing Society Limited is a registered co-operative housing society working solely under the provisions of its Registered Bye-laws, including the boundaries of relevant laws and principles of no profit and no loss basis. It aims at providing open plots to the low income employees of Federal, Provincial, Local and Semi-Governments whether serving or retired, their relatives and friends residing in Sindh. Government Employees Co-operative Housing Society Limited Karachi new project of residential & commercial plots official launching is expected soon. The society land is situated on main Super highway about 35 Kilometer from Sohrab Goath in District Jamshoro with beautiful surrounding very close to other Cooperative Housing Societies. The GECHS provides residential plots of different sizes and central commercial area in every block. It provides all utilities and comforts with its boundaries. Roads, Water Supply System, Electricity, Gas, Sewerage, School, College, Hospital, Dispensaries Mosques, Security System and boundary Wall. Anybody interested then can contact me. please share you contact detail i have some plot. NEED A PLOT OF 500 sq.yard or 240 sq.yard. 240/120 sq yds plot available in GECHS . Serious buyers can contact me on 0345-2155010. Hi 500 sq yard and 250 sq yard plot required with complete documented file. FOR SALE/PURCHASE OF PLOTS PLS CONTACT +92-333-2168058. Hi, 240 yard plot required. Please contact at 0345_6030866 if someone selling. What is the current market value of 120 sq yard,240 sq yard and 400 sq yard??? Those interested can contact . 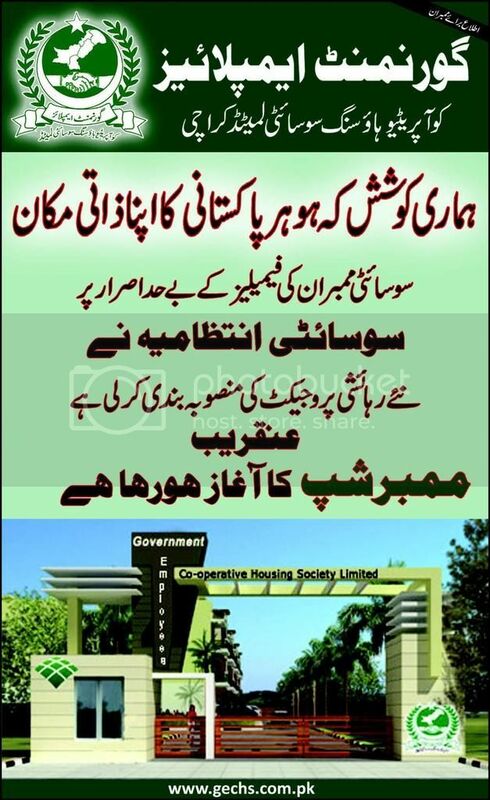 My Name is Rashid Ali I bought A Plot measuring 240 Squre Ft in Sindh Govt Housing Society Karachi. can you check on the map prepare the copy of allotment orders.